For as far back as I can remember either my mom or my grandma would make Irish soda bread for St. Patrick’s Day. I love that I can go back through their handwritten recipes to re-create the meals and treats, like this, that my brother’s and I grew up on. 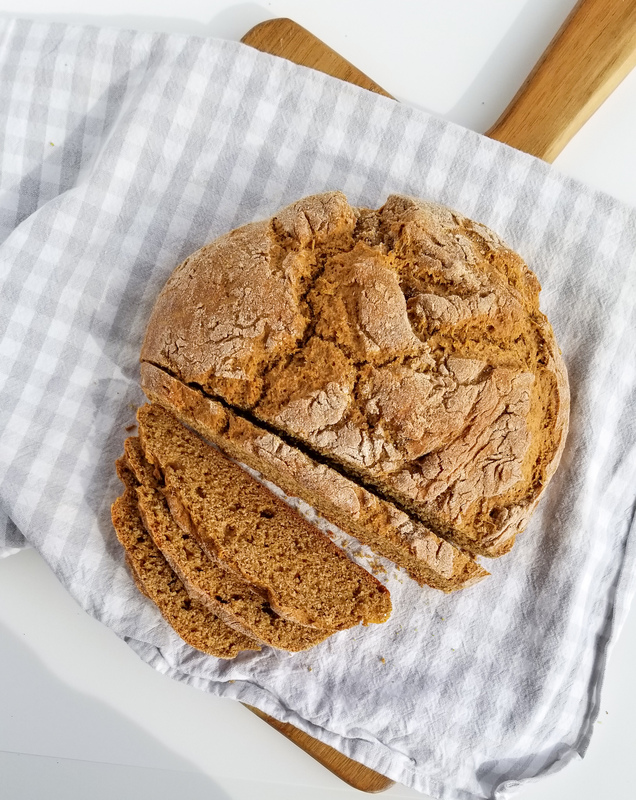 I usually try to make a healthier version of the recipe (of course, haha) and that’s exactly what I’ve done with our family’s Traditional Irish Soda Bread. Even though the ingredients may differ, the taste, texture, and aroma of the bread will forever remind me of St. Patrick’s Day at my Grandparent’s home. In a large bowl, mix all dry ingredients together. Set aside. Using a 2 cup measure, add oil and egg. Mix well. Add milk to make a total of 2 cups of liquid. Form dough into a thick round and place in a greased cake pan (or baking sheet). Using a sharp knife, score the loaf with a cross to allow it to expand during baking. Bake at 350 F for 50 – 60 minutes or until cooked through. Cut and enjoy with butter, jam, soups or stews! Note: This bread is intended to be on the drier side than what you may be used to. It is traditionally enjoyed with soups or stews.